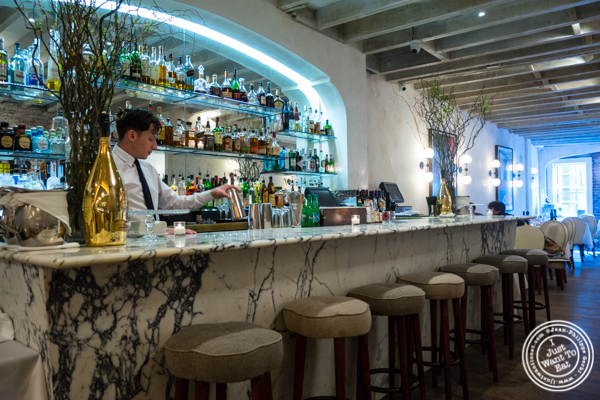 Located in Soho, Mamo NYC is the outpost of Mamo Le Michelangelo, a restaurant in Antibes, a city in the French Riviera. I had this place on my very long list of restaurants to try and took the opportunity of having an OpenTable reward to dine there. And what a meal! At first, I thought it was a small place, not knowing that it is on multi-levels. They did not sit us in the first floor that had a small dining room, but on the second floor with its bar and quite large dining room decorated with large Colorful old movie posters (I should mention the old photos of actors and singers like Charles Aznavour or Gerard Depardieu). The dining room was quite elegant and with lots of light so we could admire each and every dish that was served. Interesting detail: each table had tomatoes and a lemon, but not for consumption. They first brought us some bread, one of them being a delicious focaccia that I bet was house made, especially considering that they do offer focaccia on their menu. I started by ordering a Negroni and they asked me if I would prefer an original one or the Mamo version. I went for the latter that was made with aperol, vermouth, and orange infused gin. We usually do not go for any special, but when we heard what they proposed, we could not resist. It was a deep fried burrata in panko flakes that was served with black summer truffle and prosciutto. It was the first time I have ever seen deep fried burrata and have to say that it is amazing! First, you get the succulent crust contrasting with the creaminess of the burrata and then you get hit by the delicious flavor of the truffle that had an incredible smell enhanced by the truffle oil that was also in the dish. Then, Jodi ordered the raviolini with truffle. When the dish came, we immediately recognize "ravioles" these small ravioli filled with cheese (cantal cheese to be precise). It was an amazing dish: the ravioles were bathed in just enough cream and topped with a nice amount of truffle. It is definitely a dish that truffle lovers would love. On my side, I went for spaghetti alle vongole or with clams. I simply loved it. The pasta were perfectly cooked al dente and the sauce was delicious, not too garlicky. Of course, there were the clams that were well cooked and tasted fresh. We finished our meal with their house made tiramisu that was as sublime as the rest of the meal: very creamy, not too heavy with just enough coffee soaked cookies. We left amazed by the experience at Mamo NYC: the food was spectacular and the service on point, efficient and courteous. Mamo is a great place if you are looking for a good Italian meal or to celebrate an event. I would definitely go back there! If you like this post, the photos or the blog, feel free to share it or post a comment. Merci!